We have missed our children who attend the sessional days are are glad to have them back for the beginning of an exciting term! During our cooking session on Monday, the children had the chance to serve their friends the quesadillas they had made. They carried their tray of quesadillas to the toaster, waited for them to be toasted and carried the tray back to the dinner table. Each child then chose who they wanted to serve dinner to. Giving children small tasks like this helps boost their confidence and hopefully encourage them to become responsible young children. 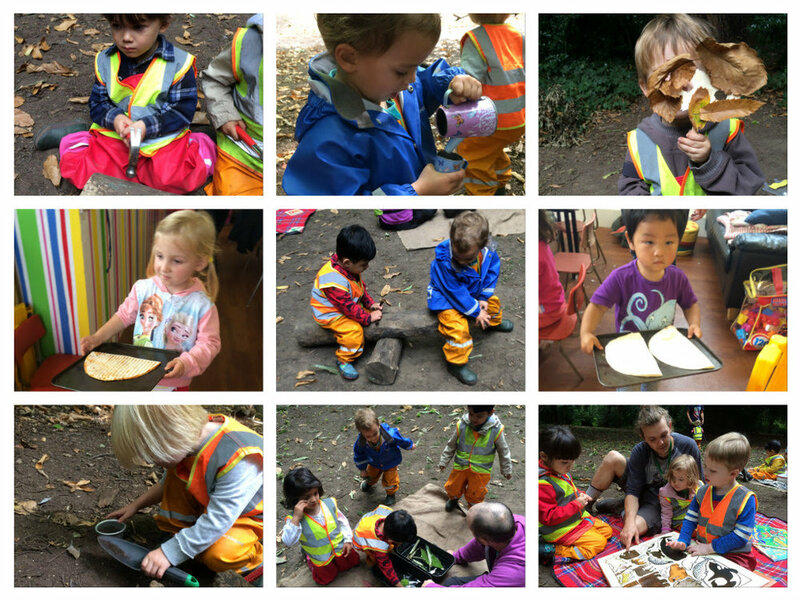 On Wednesday we did some sorting in the forest. At this time of year, the leaves are starting to change colour. We had two trays and one of them was for green plants and the other for orange. The children ran around the meadow looking for green and orange plants to put in the correct trays. Some of the children collected handfuls of loose materials from the forest and dropped it in the trays. This opened up discussions between the children. One of our leavers bought us the book Zoo-ology for our library. This fitted in perfectly with our Jungle Animals topic. It is a picture book and is the perfect size for sharing. The children sat together and named the familiar animals they knew. We put some water in trays and started to add objects into the water. The children slowly started to discover what items were floating and which ones were sinking. They ran around finding things to throw into the water and found it amusing every time something sunk to the bottom. This activity allowed children to explore the concept of sinking and floating by experimenting with objects they had found. There were some pots and pans which the children filled up with bits from the ground using trowels. After using the pots, pans, trays, sticks and trowels to cook food. One child started to notice the sound the pot made when he hit the stick on the pot. He carried on banging the stick on the pot and started to dance. Three other children joined in and found objects they could bang together to make music. They collaborated with one another and danced to the sounds they were creating. Whilst doing this, the children were expressing themselves through movement and dance. The early development of music skills facilitates learning across all key areas. We are sad to see some of our children go off to school. We have had an amazing time together exploring the fantastic forest and we will miss them all. We wish you all the best and hope you come and visit us soon! Next week in the forest our topic will be ‘All About Me’. We decided that this would be a good time to introduce this topic as we have a few new starters joining us this month. We will be talking about our families, our emotions, our senses and our bodies. To clarify, we have not started our Monday and Friday sessions at Kew Gardens yet. We hope to start these soon and we will keep you updated on this matter. Please make sure that your children have their labelled high visibility vests in their bags as they wear these on warm days.